2018 saw world powers battling it out in proxy wars in Yemen and Syria, expanding the fight through cyber warfare and even trying to force each other into submission by means of a trade war. Arguably, Turkey made the biggest geopolitical shift in the Middle East as the NATO ally chose sides against the US by deliberately targeting US-supported Kurdish forces in Syria and Iraq. Turkey’s military presence in northern Syria caused an alliance of convenience with Russia and Iran, that in turn saw huge gains for the Assad government to the point of optimism that the war could soon be over in favour of the Syrian government. This new Russia-Turkey-Iran alliance has the potential to reshape the entire region, ultimately overpowering US influence and posing a grave risk to Saudi Arabia. In East Asia, China moved from a cautiously observed communist state to the only real economic and military contender against US international influence. China’s ability to assemble all the African heads of state for a meeting, something that has never been done before, catapulted the nation to superpower status, with Zimbabwean president Emmerson Mnangagwa concluding that China is the “new world order”. China’s ‘One Belt One Road’ initiative is unrivalled anywhere in the world, and together with its continued militarisation of the South China Seas, China is set to write the history of the coming century. Despite Russia awakening fears of a military confrontation with Europe, or the controversial Brexit deal that could see the future breakup of the European Union, no one country made more impactful geopolitical shifts in 2018 than the United States of America. In many ways, the US became more state-centred in its approach to geopolitics: withdrawing from numerous international agreements, building physical walls of exclusion, and reducing its role in international affairs. This year saw some dramatic moves from the US, which has shaken the world in ways not seen before. The world took notice when the Trump administration moved the US embassy from Tel Aviv to Jerusalem, in a deliberate move to show its uncompromising support for Israel, and its non-recognition of Palestine. 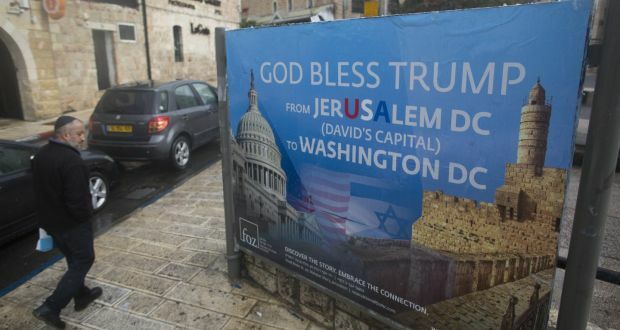 The move, which coincided with Israel’s 70th anniversary, set the tone for future US interaction in the region as it declared Jerusalem as the ‘true capital’ of Israel. This sent a clear message to Palestine – which also claims Jerusalem as its capital – that the US backs Israel. Mr Trump maintains that Jerusalem is the hard part of negotiating peace between Israel and Palestine, saying that “recognising Jerusalem as the capital of America’s closest ally has taken Jerusalem, the toughest part of the negotiation, off the table.” However, Palestinian president Mahmoud Abbas called the move a “slap in the face” and said it no longer regards the US as an honest negotiator of peace. As a result, together with America’s diminishing role in the region, other world players like China and Russia have offered to broker peace. During Donald Trump’s election campaign, he promised voters that he would end China’s unfair trade practices and put a stop to its continued violation of intellectual property rights that causes an estimated $600 billion loss per year. In theory, placing tariffs on Chinese imports are supposed to make them more expensive and US products cheaper, but cheaper goods don’t necessarily mean financial growth. The idea behind the tariffs, according to VOX, “was to level out the trade deficit and make China buy more US goods, but, as expected, China responded by slapping its own tariffs on American imports. And Mr Trump’s steep tariffs on all imported steel and aluminium, which went into effect in March, have led other US trading partners to add their own retaliatory duties on American goods.” As a result of imposing tariffs on China, specifically on steel and aluminium, the European Union, together with Canada, Mexico and India, have placed their own tariffs on US products in what has now become known as a trade war between the US and the rest of the world. The US withdrawal from the Iranian nuclear deal, brokered by former president Barack Obama in 2015, was perhaps the biggest upset in geopolitics this year. Making good on an election campaign promise, the Trump administration reversed the diplomacy of the Obama administration, moving closer to direct confrontation with Iran. The US withdrawal reintroduced sanctions, limiting Iran’s ability to trade with the rest of the world. The withdrawal also increased the divide between the US and Europe, with the UK, France and Germany vowing to keep the nuclear agreement alive from their side. If the agreement falls apart completely, it would place European countries who trade with Iran at risk of being sanctioned by the US, if they continue to do business with Iran. The withdrawal inadvertently placed the US and its European allies on opposite sides of the table. However, of greater concern to analysts is the possibility of yet another war in the Middle East. Iran has threatened to continue with its nuclear programme if America continues with sanctions, and both Israel and Saudi Arabia have threatened to attack Iranian nuclear plants if Iran follows through with its threats. The US remains the ‘flagship’ Christian nation, with the highest number of believers and the largest mission force in the world. Whatever the US does, whether consciously or not, it impacts the global Church and the face of the Church to the rest of the world. It is a significant role-player. Despite the inward shift in US focus, the three key events mentioned above have had, and continue to have, a far-reaching impact around the world. None of these events would have happened under the previous Obama administration, thus it is undeniable that the leadership of Donald Trump has played a pivotal role in the unfolding of these events. These geopolitical shifts have caused a tremendous shaking: politically, economically, geopolitically and spiritually. It has been a tumultuous year, where the status quo has been hammered, and it has caused people to question what is going on, and how it will end. In a spiritual sense, more growth takes place through difficulties and challenges than in times of rest and ease. People seldom call on the Lord when their lives are easy and “going according to plan”, but during times of shaking, that’s when people have cause to cry out, and reach out to One who is greater than the apparent chaos. Fire is a destructive element, but in nature it plays an important role, clearing the dead brush, making way for new growth, and even causing some seeds to sprout that would not have done so under any other circumstance. However, fire too can get out of control and destroy the good and the bad. Similarly, stormy weather can knock down old, dead trees, making way for new growth, but it too can be catastrophic, destroying the good and the bad. The Bible clearly states that the Lord raises up and deposes leaders for a season (Daniel 2:21), and such leaders can be both constructive and destructive, as can nations. The challenge for believers is how to respond in times of shaking: does one throw up one’s hands in despair, cower in fear, or boldly bear the light of hope and truth one has found in Christ?